“No matter what distances you’re racing, incorporating weekly speed-work is guaranteed to help you run faster times,” said this week’s guest Alix Slayton. 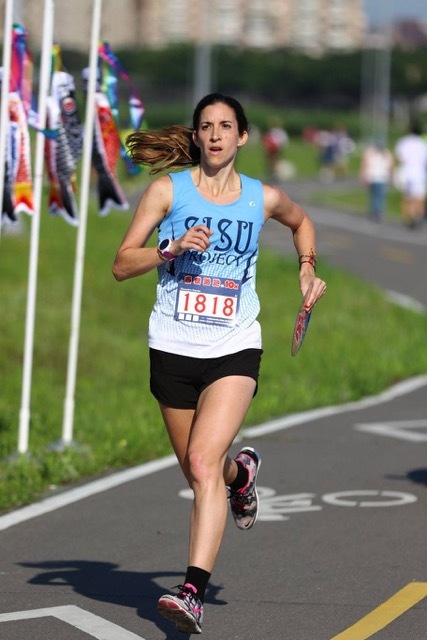 She was a middle distance specialist and cross-country runner in college and a podium regular at our monthly Riverside 5K time trial. It’s a pleasure to have her share a favorite work out aimed at improving 5km. She started competing in track and field at the age of 12, and ran both cross-country and track in high school and university. Post-college, she transitioned to road racing and moved up to the marathon distance and began trail running as well since moving to Taiwan. Without further ado, let’s hand it over to Alix. For example, my 5k goal for next race is 19:00, which is about 3:48/km or 1:31 for 400 meters. Therefore, my aim for the workout is 1:28 per lap. The rest is short, not allowing for much recovery. At this point in training, if that rest feels sufficient enough to get me through all 12 sets, then that gives me confidence that I can maintain my target pace during the race. Keep in mind this workout will look different depending on where you’re at in training (beginning, middle, or end of race season), and fitness level. Always begin with a 15-20 minute warm-up to loosen muscles and increase blood flow. Beginners should aim for 4-6x400m with a 200m slow recovery jog between each rep. End with a 10-15 minute cool-down. In addition to speed-work on the track, I also run 8-10 strides (also known as accelerations) after training runs. Beginners should aim for 4-6 strides. Ideally, you want to find a softer surface than pavement to run these. This is something my high school and university coaches instilled in me in order to work on mechanics and maintain a faster turnover. What is a stride? Strides are about 100m accelerations where you start at a jog, build to about 95% of your max speed, and then gradually slow to a stop.